Welcome to my Wishlist! I wanted to share a few things that are both on my real and "if only" list and maybe give you some ideas in the process. What do I mean by "if only"? 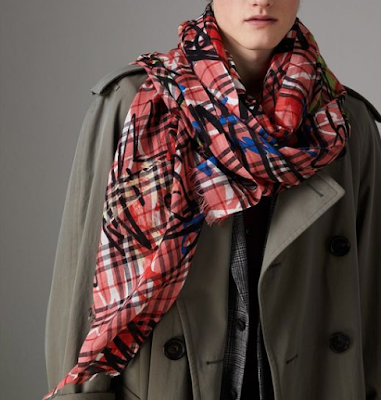 Well, I've seen the Burberry graffiti scarf a couple of times in person and it is so up my ever-lovin' alley, BUT in my climate (and my future climate), it will not get enough wear to warrant it's price, which would be daily in my book. It is currently marked down, though, so if you are in a climate that it will work for you, then "Yay!" 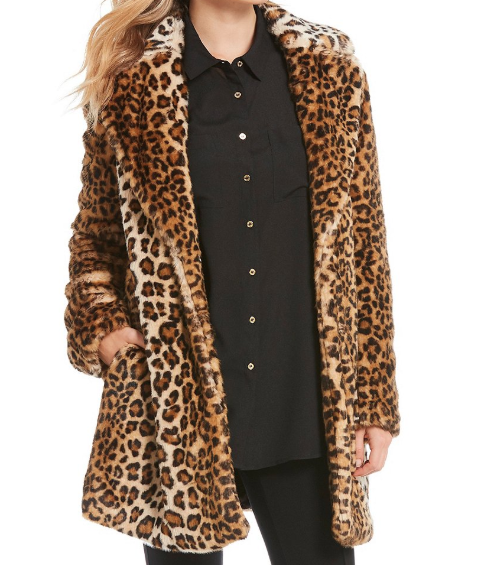 Faux fur leopard coat. Because they are glamorous, fun, warm and on-trend. Jo Malone fragrance. Both Blackberry and Bay and Grapefruit are favorites. I sometimes wear them together. The Blackberry and Bay bath oil goes right on my skin, then may be followed up with the Grapefruit spray. Everyone who smells the Blackberry and Bay really likes it. The fragrances are light and subtle. You owe it to yourself to go to a Jo Malone counter and try some if you haven't yet. Brahmin Small Camille Satchel in Toasted Almond. The toasted almond colorway is only available at Dillard's. This color is pleasing, because it is a neutral, warm tone, but not too dark. 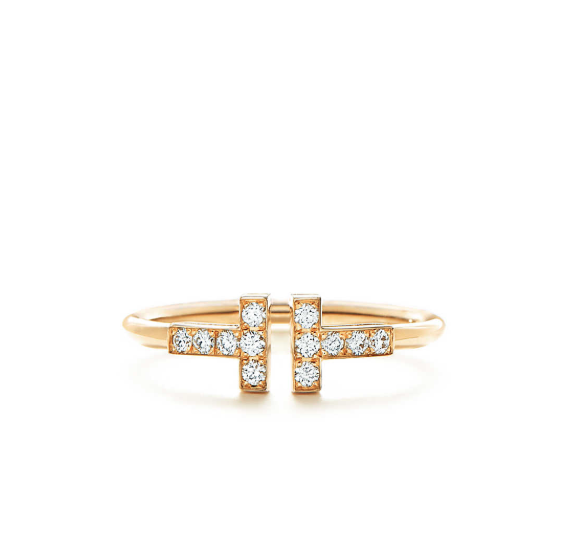 Tiffany T Wire Ring. 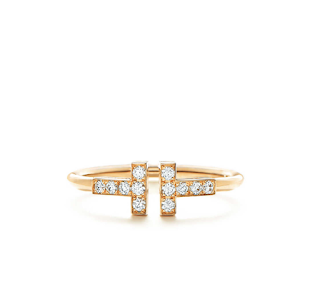 The Tiffany T collection really appeals to me, because it has a casual elegant look. Michael Kors Watch. I have a collection of watches. Most of them have seen their better days and were relatively inexpensive. My go-tos right now are identical Fossil Georgia watches, one in gold with a gold leather band, one in rose gold with a warm grey band (it looks dark brown to me). They have narrow bands so can be stacked with bracelets. Although the model below is not exactly the one I have in mind, I'd like something more substantial than my current ones. New sheets. I don't have any one favorite brand, but we currently have a used Ralph Lauren and it's wearing like iron! Laura Mercier lip glace. There are other good brands, but I'll check out this brand first. I don't use lip gloss as much as I used to, but I still like it occasionally. Godiva Chocolates. Several years ago, my husband received a box from a client. We left them in his (home) office and once a day or so, we'd have a clandestine meet up without kids around and indulge in a piece. Now, we buy are own, but we still don't share with the kids--ha ha! Although this post is all about "stuff." No matter what's on our lists, none of it would mean a thing without those we love! Well I hope Santa brings you everything on your list! You've been so good all year! I really like that ring and bag. You have such good taste Kim and I can tell you really think things through - a skill I both admire and lack. I hope you have a wonderful weekend my friend! I have to admit that I'm so glad we all bought a leopard coat last year. Well, my mom already had one, but they are such a great statement coat...at least here where it's cold!